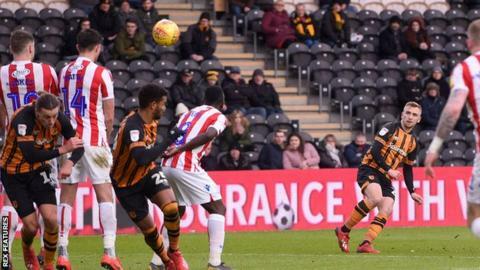 Sam Vokes missed a penalty on his Stoke City debut as Hull City resumed their charge up the Championship table with a fine victory over the Potters. Vokes, signed on transfer deadline day as part of a deal that saw Peter Crouch move to Burnley, saw his shot saved by David Marshall after being brought down in the area. His miss came less than two minutes after Jarrod Bowen had put the Tigers in front with a superb curling free-kick past England goalkeeper Jack Butland. Hull doubled their advantage in the second half through Kamil Grosicki, who slotted into the corner following Fraizer Campbell's pass. Stoke had been pressing hard for an equaliser before Grosicki's smart finish, but captain Danny Batth's header against the bar - also on his debut - was as close as they came. Nathan Jones' side have now won just once in seven matches and remain 15th in the table, while Hull moved up to 10th. The Tigers had been on a remarkable run in the Championship prior to last week's 3-0 defeat by Blackburn Rovers, at one point winning six games in a row to help propel them from relegation danger up to play-off contention. Bowen's fine form has been key to their revival, and his brilliant goal against Stoke was his 15th of the season and seventh in six league games. Vokes was brought in on Thursday to hopefully add a similar level of firepower to the Potters' attack - but his miss from 12 yards on the stroke of half-time only continued their recent penalty woes. Stoke have failed to score five of their seven penalties taken in the Championship this season, with the Wales forward the fourth different player to miss from the spot. "I thought our defensive shape was spot on today. I thought the lads worked extremely hard. Stoke spent a lot of money and they have quality players. You know they're going to have a lot of possession, but we nullified that to a great extent. "I have to mention David Marshall's penalty save on the stroke of half-time. That was instrumental. Was it a penalty? I thought it would good defending, but the referee gave it. "January windows can sometimes be disruptive in a big way, either because you lose players or you bring players in who aren't the right characters. We are a team. There are no egos here. We've got a team spirit and a good team culture. We've got a squad of players, all having a right good go." "For large parts, I was really pleased. In the first half, we had more control of the game and got into some really good areas. We just needed more cutting edge. Apart from the last minutes of the half, I didn't think we were really under pressure. "We had a chance to get back in the game but we didn't take it- that's frustrating. "The second goal is a worry. We've changed the personnel, but if you look at the second goal today, it is identical to the winner Shrewsbury scored against us and the second goal that Preston scored against us the other day. This is a cruel league. If you don't defend fundamentally right, you won't be able to get the results you need. "We have to be better than we were today, and we will be, because we'll continue to work. But the players are grasping what we're doing."